White House confirms that President Obama will host PM Netanyahu on March 3. 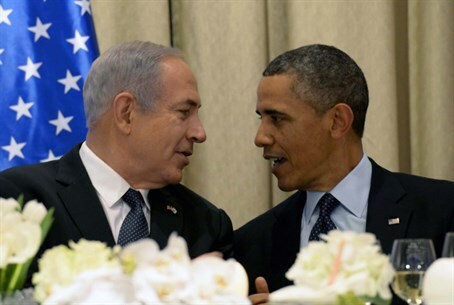 The White House confirmed on Wednesday that President Barack Obama will host Israeli Prime Minister Binyamin Netanyahu for talks on Iran and Middle East peace moves on March 3, AFP reports. Israel had previously announced that Netanyahu would travel to Washington the day before the talks for a visit which also includes a speech to the annual conference of the American Israeli Public Affairs Committee (AIPAC) lobby group. "The president looks forward to discussing with the prime minister progress in Israeli-Palestinian negotiations, developments in Iran, and other regional priorities," a White House statement quoted by AFP said. "Prime Minister Netanyahu's visit is a demonstration of the deep and enduring bonds between the United States and Israel, and our close consultations on a range of security issues," the statement added. The talks between the two leaders will take place as Washington and its global partners seek to turn an interim deal which halted some aspects Tehran's nuclear program in return for a slight easing of sanctions, into a permanent agreement. The talks will also take place as the United States continues to push for a peace agreement between Israel and the Palestinian Authority (PA). Negotiations resumed in July under pressure by Secretary of State John Kerry, but so far little progress has been made. Kerry is soon planning to present the sides with a framework agreement. While no official details of the contents of this agreement have been made public, American Jewish leaders who were briefed by envoy Martin Indyk said several weeks ago that mentions a Palestinian state with borders based on the 1949 Armistice lines and with land swaps between Israel and the PA. 75 to 80 percent of the Jewish residents of Judea and Samaria would remain in their homes even after a permanent agreement. Thomas Friedman of the New York Times, who is considered close to the Obama administration, has also published some details of Kerry’s plan which, he said, will call for a phased Israeli withdrawal from Judea and Samaria based on the 1949 lines, with "unprecedented" security arrangements in the strategic Jordan Valley. The Israeli withdrawal will not include certain settlement blocs, but Israel will compensate the Arab side for this with Israeli territory. The deal will call for “Palestine” to have a capital in Arab East Jerusalem and to recognize Israel as the nation state of the Jewish people. It will not include any right of return for Palestinian refugees into pre-1967 Israel, Friedman said. Obama last week openly backed his Secretary of State’s peace efforts, after the top diplomat was heavily criticized by Israeli officials over his threats that Israel will be boycotted if peace talks fail.